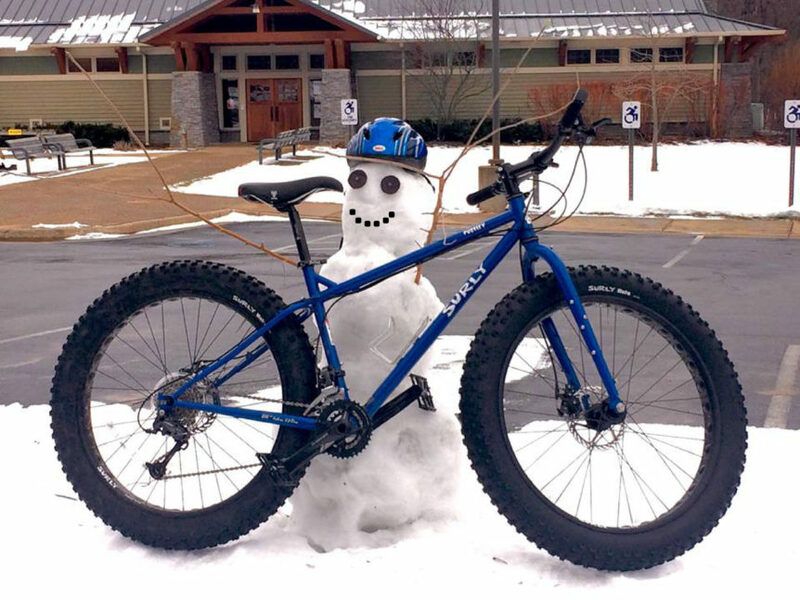 It’s hard to imagine that 15 years ago, the fat tire bike wasn’t even on any rider’s radar. Possibly a concept dreamt up by a hard-core rider or all-terrain biking enthusiast, but the idea didn’t even cross the casual biker’s mind. Today, fat tire bikes are one of the most popular bikes on the market. What makes them so appealing to the cycling public? Kip Miller runs the fat tire bike program at Love Creek Nature Center in Berrien Springs, Michigan. He has also noticed the popularity of the bikes within his own community. “Fat tire bikes have become popular in the last five years or so,” he mentions during a phone call interview, “Before we had fat bike trails, people wanted to use the cross country ski trails for riding fat tire bikes which we didn’t want happening. That’s when we decided to make the fat tire bike trails.” Since the trails have been finished, Miller reports the nature center to be free from any problems and stays off of the cross country trails. Certainly an opinion, but the overall majority concludes that fat tire bikes are just plain fun. “You cannot ride a fat tire bike and not smile,” Rob said, “It reminds you of your childhood when you first rode a bike.” Kip said. Clay Sidenbender is a student at IUSB. Here’s a few fat-tire tips gleaned from a Men’s Health article by CRISTINA GOYANES November 26, 2014. Wear clothing appropriate for temperatures 10 to 15 degrees warmer. In a sport that burns up to 1,500 calories per hour, sweaty clothing can set the stage for hypothermia. Dress in layers and skip moisture-retaining cotton. Wool or synthetic fleece with wick it away. Start off with platform pedals. Whether you are a beginner or a seasoned cyclist—if you are new to snow biking, you’re going to be putting your foot down . . . a lot. Start out with non-clip pedals and winter boots, you can always upgrade later. traction and flotation, go between 4 and 5 psi when in snow conditions. Increase the pressure to 8 to 10 psi to maximize control on non-snowy, harder ground. Avoid the temptation to stand up while pedaling uphill. When you stand up you transfer weight off the back wheel which weakens rear-wheel traction. Thus, tire spin and loss of momentum occur. Instead, stay in the saddle. As the hill get steeper, shift into progressively lower gears. Though you sacrifice speed, you maintain leverage and traction to climb the hill.